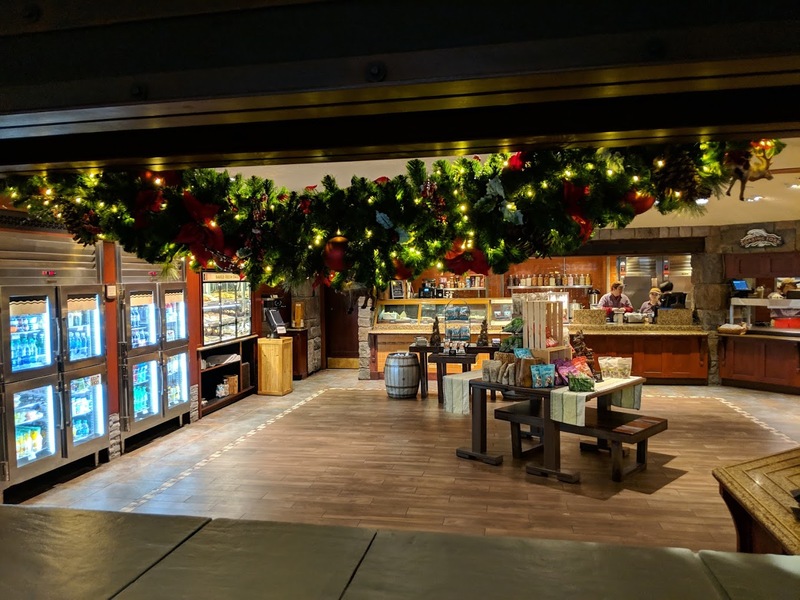 Roaring Fork is the quick service dining location at the Wilderness Lodge Resort. Breakfast, Lunch and Dinner are available between the hours of 6 am and Midnight. The menu here is pretty standard for Disney Quick Service. Burgers and Salads are of course available but the food here is bit on the heavier side and ties in beautifully with the rustic theming of the Wilderness Lodge. We were fortunate enough to stay at Copper Creek, one of two DVC resorts located within Wilderness Lodge, for a full week. 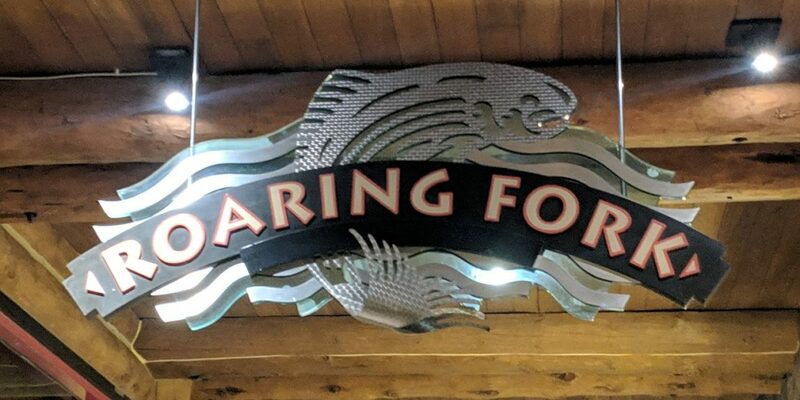 We ate at Roaring Fork almost daily so this is going to be one comprehensive review! Can I just say, if you can stay at Copper Creek, or Wilderness Lodge at all, DO IT! It’s amazing, the FULL review will be coming out soon. Roaring Fork has a menu that is heavily influenced by the rustic theme of Wilderness Lodge. The food is heavy and filling. Of course there are a few exemptions from this but even these items have a flare that’s woodsy. One thing that has become more common place over the last few years at Walt Disney World is that there are more Vegan and Vegetarian options available. I hate to say this, while most options have improved through the years Roaring Fork fell a little flat on their vegetarian options. Breakfast at Roaring Fork is filled with pancakes that are loaded with sauces, grits, bacon, eggs, biscuits, potato barrels. See what I was saying earlier? The Food is heavy. Healthier options are available in the form of steel cut oats, but again, oatmeal is a heavier breakfast option. I’ve got to give a lot of credit to Roaring Fork for their pastry selection. Not only did they have the standard croissants, cinnamon rolls, and Danishes they had a stellar Bear Claw and some specialty donuts that Kaitlyn loved. 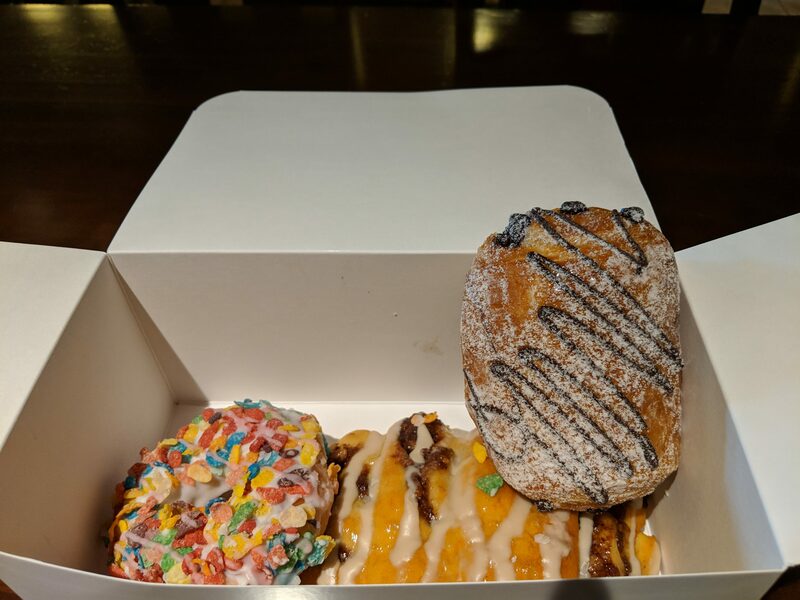 Fruity Pebble Donut, need I say more? Lunch and Dinner has a lot of options too. Two Salads, a vegetarian Sandwich, Pulled pork, flat breads and so much more. Here’s a link to the full Menu. Ok guys, are you ready for this? It’s so much more food than we usually get to try at the Quick Service locations!! If they have it, get it!! It’s basically the hostess cupcake that we all grew up with but fresh. It’s amazingly light and the marshmallow fluff is melt in the mouth. Not to mention it’s an adorable cupcake! How often does Disney do cupcakes that are cute and taste good?! This is a solid choice for breakfast. It’s eggs, bacon, sausage, potato hash and a biscuit. Kaitlyn and I easily split it and we both really enjoyed it. The biscuit is a cheddar biscuit and of excellent quality. If you were thinking of heading over to Whispering Canyon Café for Breakfast to get the All You Can To Enjoy Platter…this is pretty much what you get. I only add this because if you are on a budget you can get an equally delightful meal at Roaring Fork while staying on budget. Three Mickey Waffles piled high with Strawberry Sauce, Chocolate Chips, Caramel, Chocolate Sauce, Banana Fosters and Whipped Cream. Adolfo ate this for breakfast and I think I might have looked a little bewildered. This looked like a stomach ache waiting to happen to me! He, however, said it was good and he’d gladly get it again. This was good but a little underwhelming. You could tell it had been sitting for a while and was premade. If it had been a little bit fresher it would have been a much better meal. 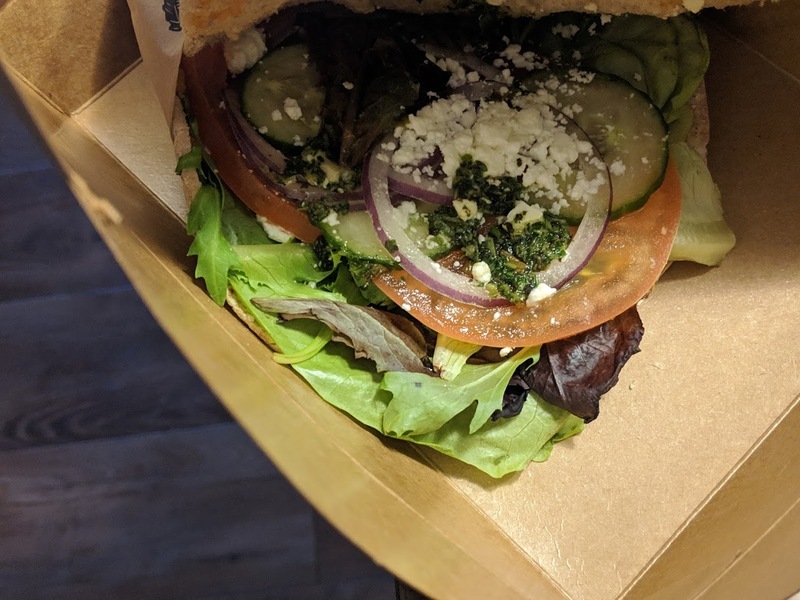 This is served on a thin whole wheat round, with a thin layer of red pepper hummus with greens, feta, red onion and cucumbers. This is hands down our favorite salad in all of Walt Disney World. Fresh mixed greens with apple, cheddar cheese, spicy candied walnuts and apple vinegrette. It’s not stated on the menu that that it comes with cheese but both times I ordered it, cheese was on the salad. It also came with some amazingly good homemade croutons. This was sooo good and sooooo messy. 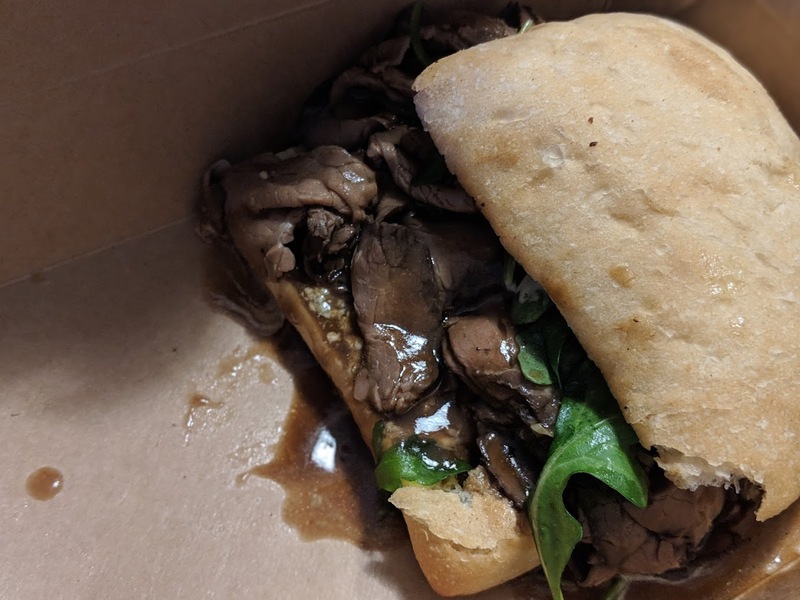 A hot roast beef sandwhich flooded with buttermilk chive dressing, blue cheese and arugula. Two thumbs up for us. It also comes with house chips aka kettle chips. The homemade Disney Chips are a favorite in our household and Elyse prefers them over the fries. Unfortunately this is a hard pass from us. We like our brats to have some snap and this was a mushy mess. 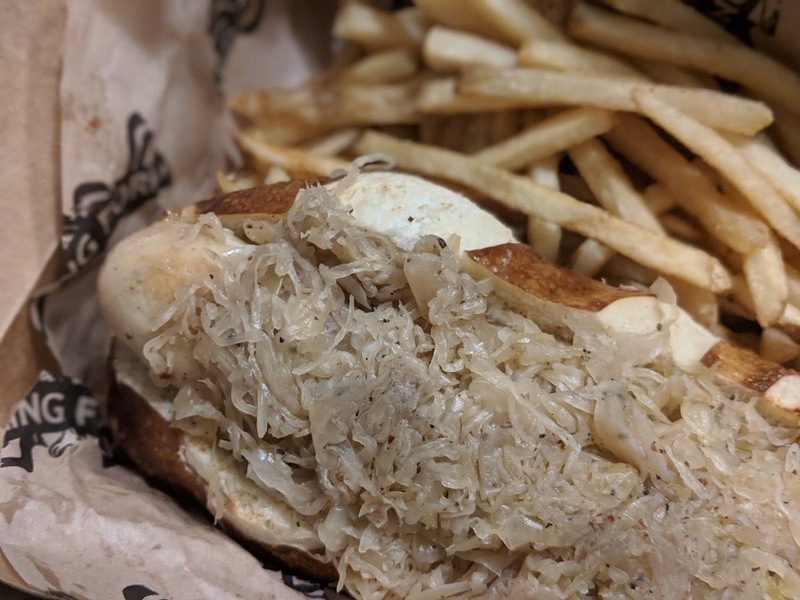 The overly soft Brat combined with saukraut was just too much for us and we couldn’t finish more than a few bites. Too bad because the pretzel roll was delicious and so was the grain mustard. The Caesar salad was very basic, except for those amazing homemade croutons. Skip this and go right for that Wilderness Salad! This was very good! It had a great sauce on it and we got the slaw on the side. We highly recommend this if you like a good pulled pork sandwich. Absolutely! Only if we were staying at Wilderness Lodge though. This is a bit of a trip from Magic Kingdom and all of the other parks and resorts. We can’t say that we would take Disney transportation just to eat here. However, if we had a car with us and time wasn’t an object we would absolutely stop in again to eat here. Its fairly priced and the food is genuinely good. Keep in mind that because Wilderness Lodge is a resort unto itself that it is quite often busy here. We’ve had to stand in line for thirty minutes to order and then wait another 20 to 30 minutes for the food. If you are going to stop in we recommend it during off season.